In a previous article I talked about the advantages of password manager software (8 reasons why you should be using password storage software) but here I’d like to take the time and explain a bit more in detail what it is exactly. Most people would agree that in this day and age we have to remember so many passwords that it quickly becomes very complicated. Not only do you need a password for an ever-growing multitude of online services, they also have to abide by several different sets of rules. Your mailbox password may have to be a minimum of 6 characters long and contain 1 uppercase letter, while your cloud file storage password may need at least 8 characters and must contain punctuation. Coming up with one good password for all your online needs is not an option (and not a very good idea either). In the early days when computers connected to the internet via dialup modem connections, we had to remember one password to login to our internet provider account and we accessed our e-mail account with that same password. That was long, long time ago. Floppy discs were a brand new technology. Dinosaurs were running on the streets at that time :-). Today, I see people who are struggling with their digital life every day. Facebook accounts, webmail, online shopping accounts, home banking and so on and so on, everything protected with passwords that have to be complex and secure. Of course you can easily come up with a new password to create an account for the new online store you’ve discovered, but what happens when you visit the same store again a couple of months later and you start doubting whether your password contained your birthday or that of your spouse? Sounds familiar? How do other people deal with this? From what I have seen, I can assure you that most people struggle with this pretty much the same way. But that doesn’t mean you should. It’s time to take a look at password manager software. 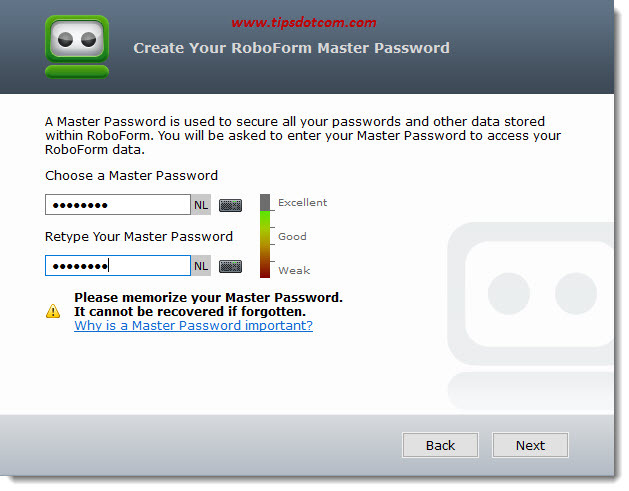 You can find password manager software in many different flavors and forms but the one I use personally is Roboform. 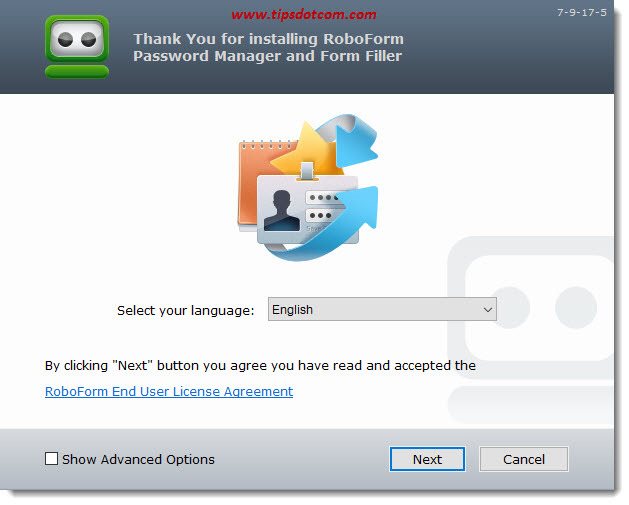 The screenshots below contain Roboform dialogs, but the idea is more or less the same with any password manager software: offer one secured database containing all your passwords that can be accessed with one master password. Most password manager software solutions also offer a synchronization feature so that you can use it on any computer, laptop or mobile device. You can try Roboform risk-free with their free, full featured edition. The free edition has all the features that the paid version also offers with only one limitation: it will only hold a maximum of 10 passwords. Let’s take a look and see what happens when you install password manager software on your computer. The image below shows the Roboform installation wizard. The wizard automatically detects all installed browsers on the computer so your passwords are always ready to use, no matter which browser you’re using. In the next screen you have the choice between storing your passwords in an online account or locally on the current computer only. Select an online account if you want to keep your passwords synchronized across multiple computers, laptops, tablets and other devices. 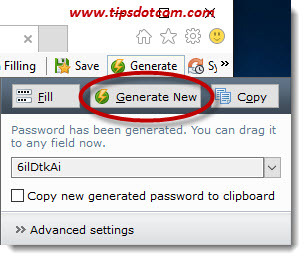 Now fill in your information to create an online account for your password manager software. Next you have to come up with a master password to access your password database. 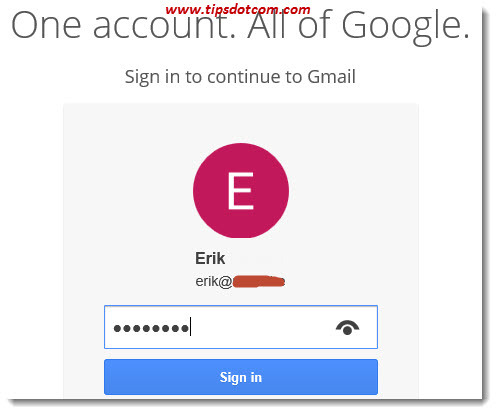 The wizard will then continue and set up synchronization for your password account. 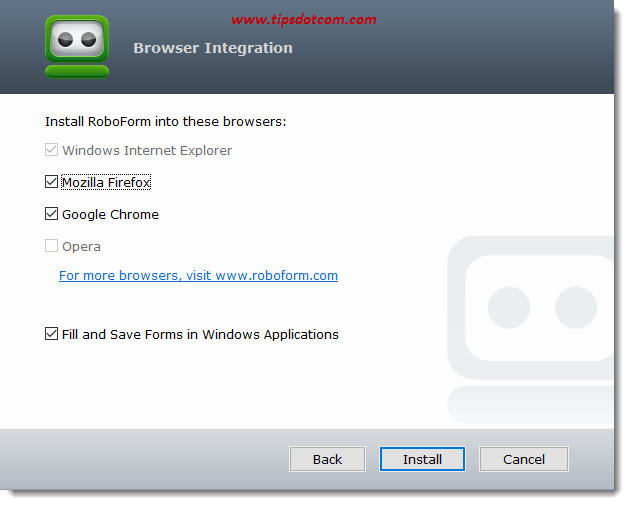 When the installation is complete, you’ll notice a Roboform toolbar with a welcome message if you open your web browser. 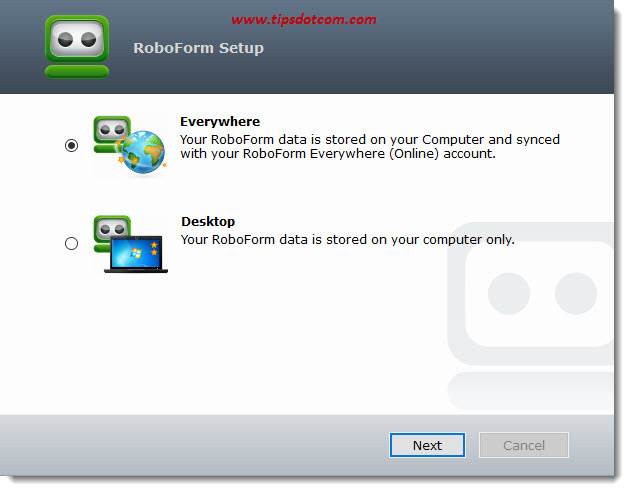 The welcome message has an online manual and tutorial that will get you up and running quickly, but Roboform is pretty intuitive to use. Let me show you what happens when I log in to my Google account. As soon as I’ve entered my password to access my account, the Roboform password manager software automatically detects this and immediately offers me a “save” button so that I can save this password in my secured password database with one click. Once the password is saved, I can re-use that on any other device via my Roboform account. With any subsequent visit to that same login page, Roboform automatically has my back and immediately offers a button in the toolbar that fills out my password and logs me in to my account with one single click. No more wondering about whose birthday I used when I created the password. 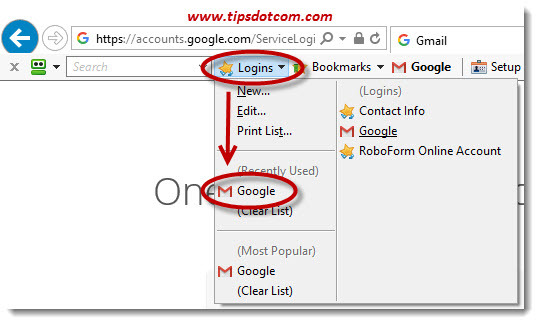 Or, and this may be even better, you can use the “logins” button in the Roboform toolbar and click the button for your saved Google account password. 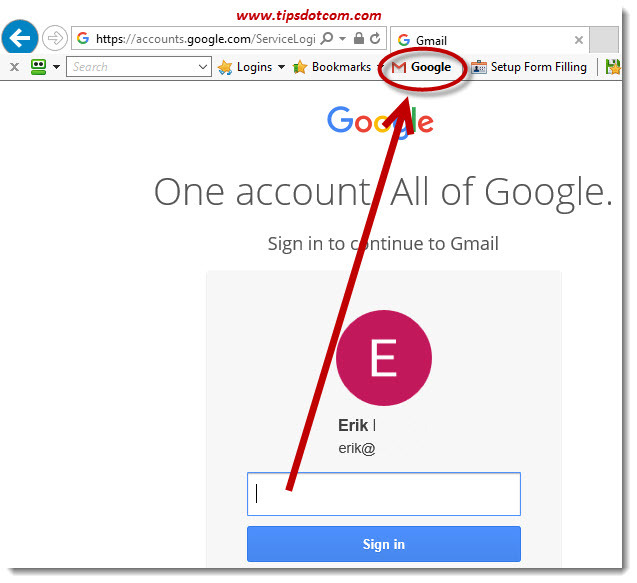 Roboform will then automatically go to the Google account login page, fill out your password and log you in. You don’t even have to go to the trouble of finding the login page. The next time you’re creating a new account for something and you have to come up with a strong password, your password manager software will also come to the rescue. A good password manager comes with a feature to generate secure passwords for you so you don’t have to. It goes without saying that these passwords are also automatically saved for you in your secure passwords database. I can honestly say that using a tool like this has dramatically made my digital life easier and much more organized. This is easily one of the most sympathetic computer tips and tricks to recommend to anyone because the feedback I received from people who started using it has been amazing. Please feel free to leave a comment in the section below, I’d appreciate it thanks!